It's happened quite a few times in the past couple of years: I've booked and planned a trip, only to arrive and find out there was some huge local event going on that I knew nothing about. Sometimes it's annoying (like showing up in Liverpool on marathon day and trying to convince a grouchy taxi driver to try to find a way to your hotel). Other times it's incredibly fun (like booking a trip to Edinburgh during the Fringe Festival without even realizing it). 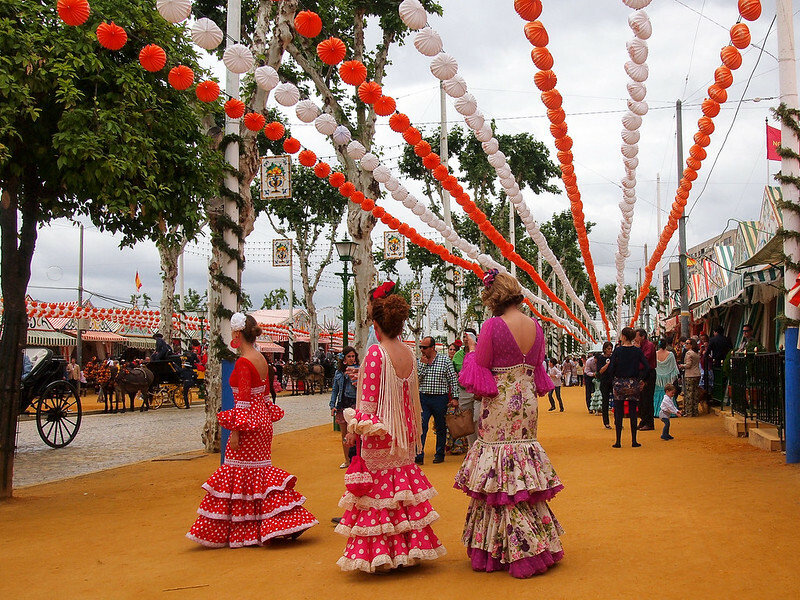 Thankfully, winding up in Seville during the city's Feria de Abril last year fell into the latter, “incredibly fun” category. 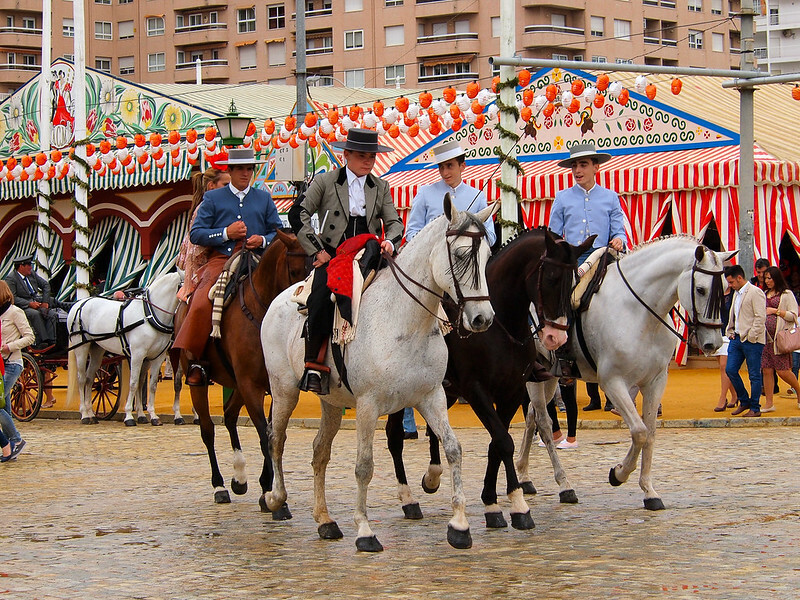 The Seville Feria is a weeklong fair/festival that takes places each year in April or May in Andalusia's largest city. The fair always begins two weeks after Semana Santa (the huge Holy Week celebration leading up to Easter) ends, and is probably unlike any “fair” you've ever been to before. The Feria has its roots not in a festival, but actually in a livestock market. 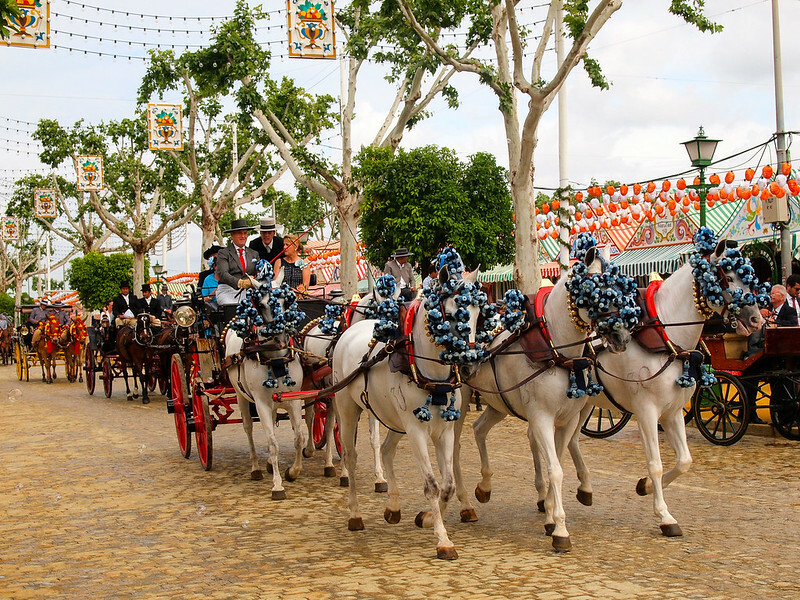 Back in the mid-1800s, people would come to Seville during this time of year to sell cattle and other animals. Over the years, the market took on a more festive feel, and eventually expanded from just a couple of days to a full-blown 6 days of celebrations. Today, you won't find any cattle for sale at the Feria. What you'll find instead are horses, carriages, colorful casetas (tents), and traditional clothing worn by just about everyone. This means bright, colorful flamenco dresses for the ladies, and the traje corto, or short suit with wide-brimmed hat for the men. Like I said, I arrived in Seville with no idea that this event was taking place. 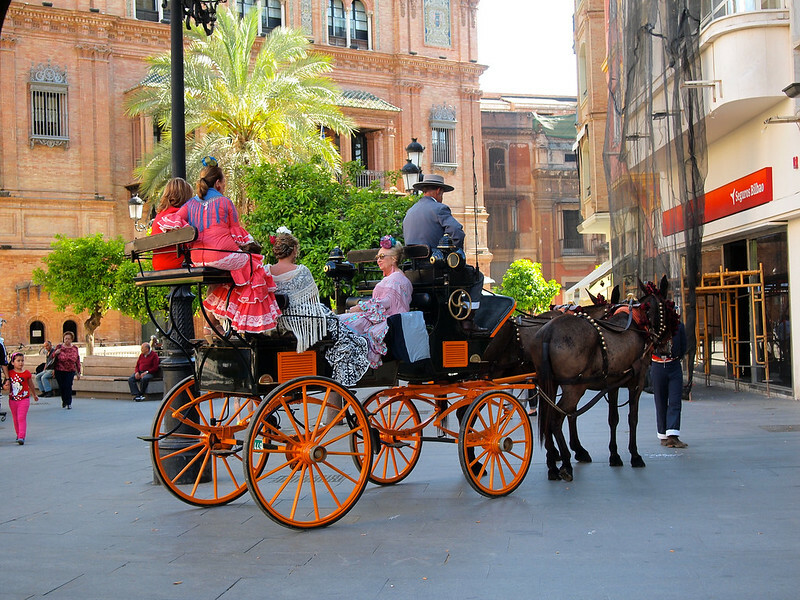 So imagine my confusion – and curiosity – when I began to see horse-drawn carriages filled with women in fancy dresses making their way through Seville's old town one afternoon. 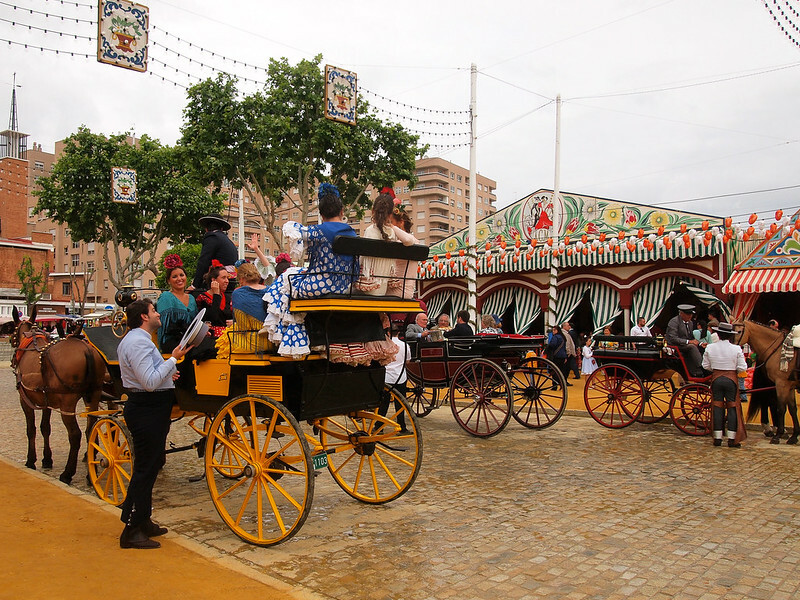 I quickly did some Googling and found out about the Feria and the tradition of arriving to the fairgrounds in style, either by carriage or on horseback. I also discovered that I could absolutely go check it out as a tourist. 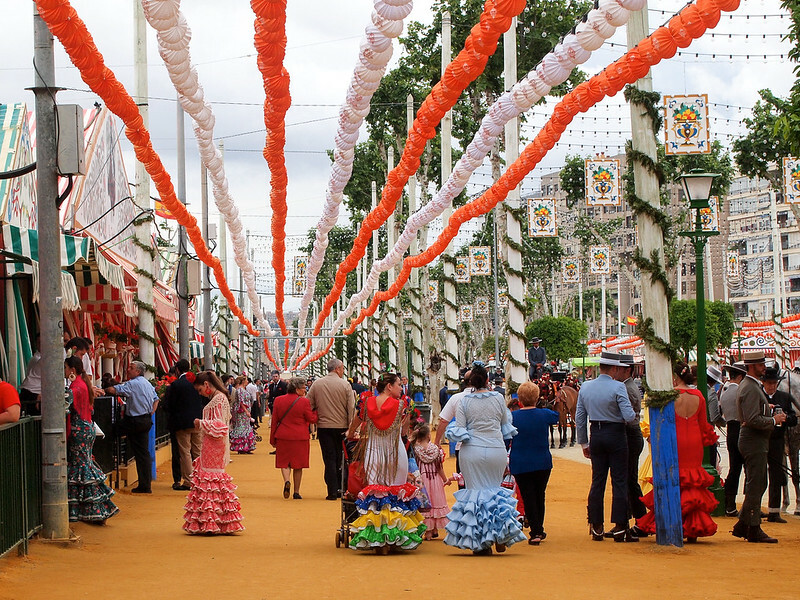 Seville locals (and expats) will tell you that the Feria is kind of an insular event. This is because the casetas are mostly private, being owned by companies, groups of friends, political parties, religious groups, families, etc. Which means that unless you know someone, you probably won't be dancing and drinking the night away in any of these colorful tents. But that doesn't mean that you shouldn't go check it out anyway. 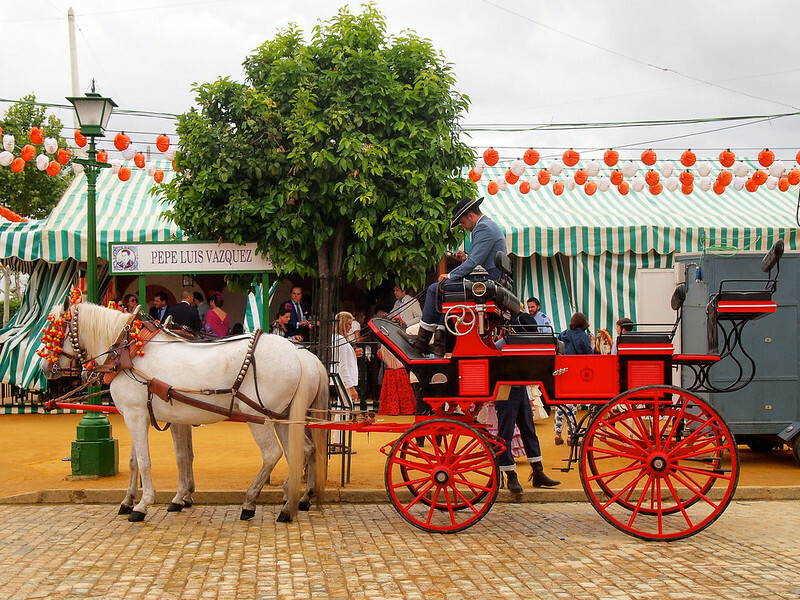 If you find yourself in Seville during the Feria de Abril, here are some tips for checking it out as a tourist. Just inside the entrance to the fairgrounds (through the massive portada or main gate), you'll find an information booth. Here, you can pick up a map of the fairgrounds and some info about the Feria. Once or twice a day, you can also join a free walking tour around the fairgrounds with a local guide. The tour is pretty basic, and it can be difficult to hear the guide if your group is large or if the part of the fairground you're in is particularly noisy. But it's a great way to get a feel for the Feria. You'll learn about the history of the festival, the outfits, and the casetas. The guide will tell you about the first night of the Feria (always a Monday night) when the fair is officially “opened” and the fairgrounds and portada are lit up by thousands of lights. You'll also learn about the portada itself – the design is different each and every year. The tour ends in one of the public casetas, where you can grab a drink or some food. The public casetas are similar to the private ones – there's usually a bar, food for purchase, and music. I went in one to see what it was all about, but didn't stick around too long since I was on my own. 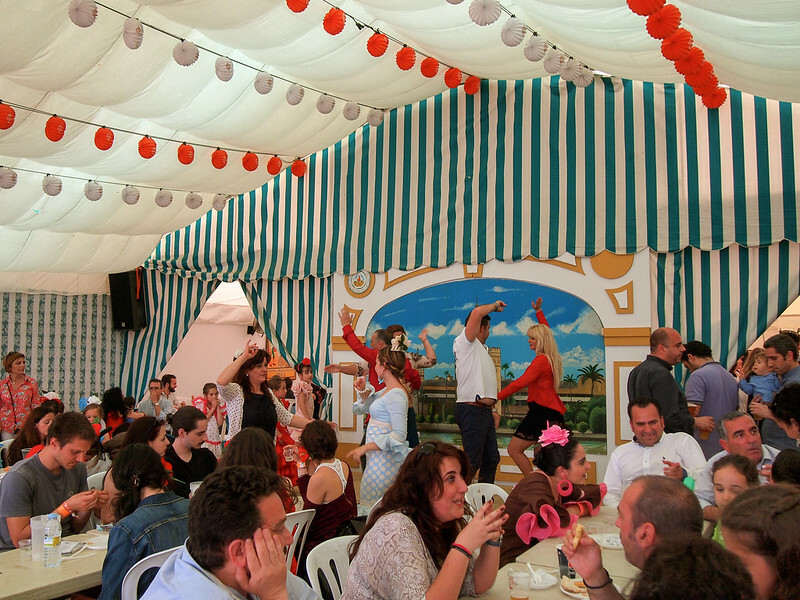 The Feria is definitely a social affair, and I think hanging out in a caseta would be way more fun with friends. On opening night of the Feria, fried fish – pescaíto – is the main thing on the menu. On the other days, the food offerings mainly depend on the individual caseta, but usually include a variety of tapas. 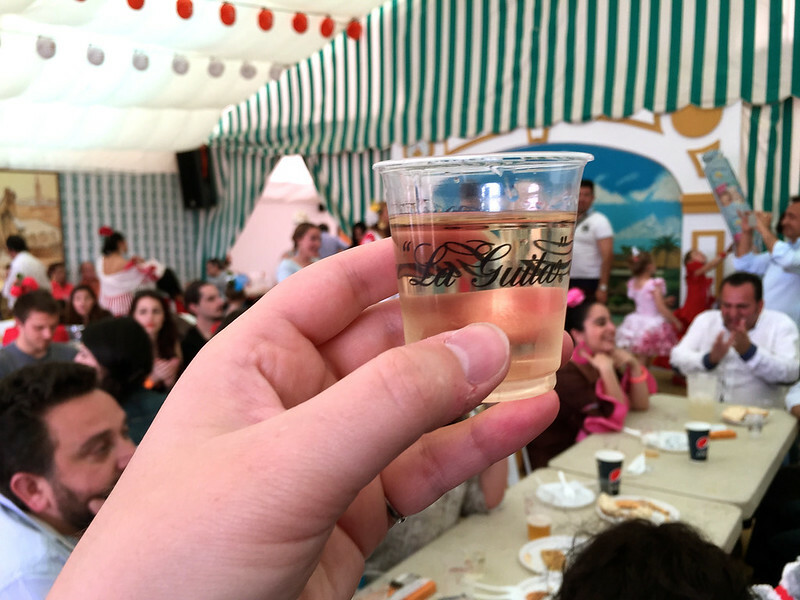 There are some typical Feria drinks that you'll find everywhere, though. Like manzanilla (a type of sherry) and rebujito (a mixture of manzanilla and lemonade). For dessert, you'll definitely want to seek out some churros and chocolate. My favorite part of the Feria was just walking around and soaking up the atmosphere. 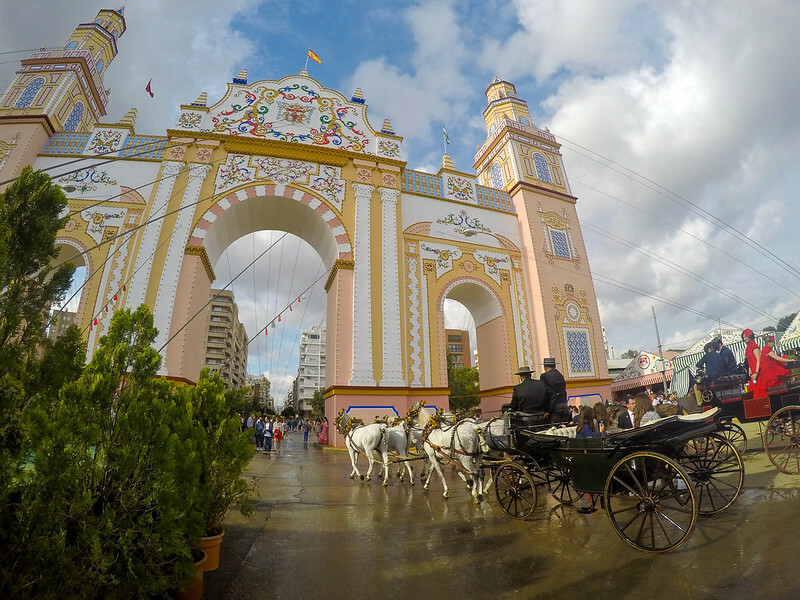 Afternoon at the Feria is the time to see and be seen – this is when you'll see everyone arriving in carriages and on horseback, and see ladies and families walking around in their Feria finest. I enjoyed wandering around and taking photos of the colorful casetas (there were more than 1,000 of them in 2015) and flamenco dresses, and watching the dancing. Because, even though people mostly dance sevillanas (local dances) within the casetas, it's not uncommon for the revelry to spill out into the streets. 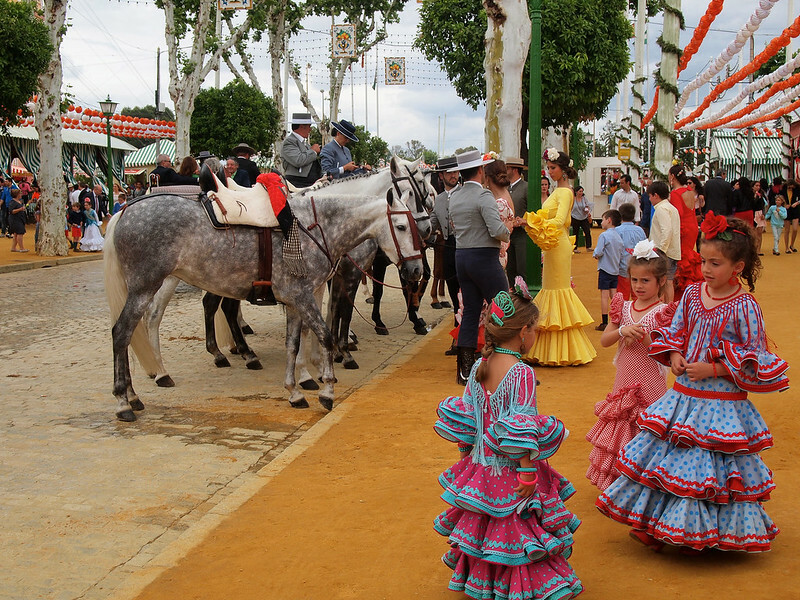 There are other events and things going on during the Feria, too, such as nightly bullfights. I, however, do not condone bullfighting, and would never go to an event like that myself. So unfortunately I can't speak to that part of the Feria festivities. I CAN say, though, that I had a lot of fun during the few hours I spent wandering aimlessly around the Feria grounds. 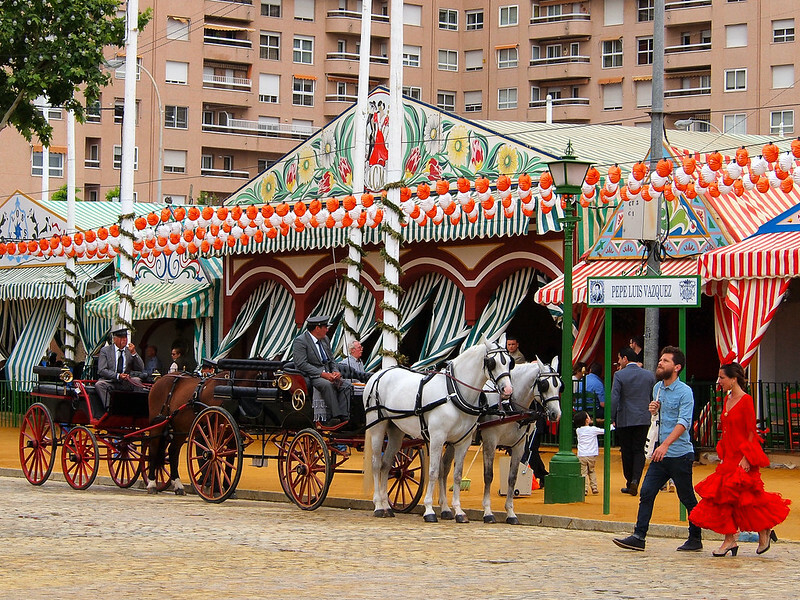 When: The Feria de Abril starts on a Monday evening roughly 2 weeks after Easter. The dates vary by year since Easter doesn't fall on the same date all the time, but it's usually in mid/late April or early May. In 2019, the dates will be May 6-12. Where: The Feria happens at the Real de la Feria, which is in Los Remedios to the south-west of the city center, next to the river. Getting there: Don't want to shell out for a carriage to drop you off? You can also take a taxi (expensive), the bus (much more economical), or simply walk. The closest metro stops are Plaza de Cuba and Parque de los Principes, or it takes a little over 30 minutes to walk from the Seville Cathedral. If you don't know the way, just follow the ladies in dresses! 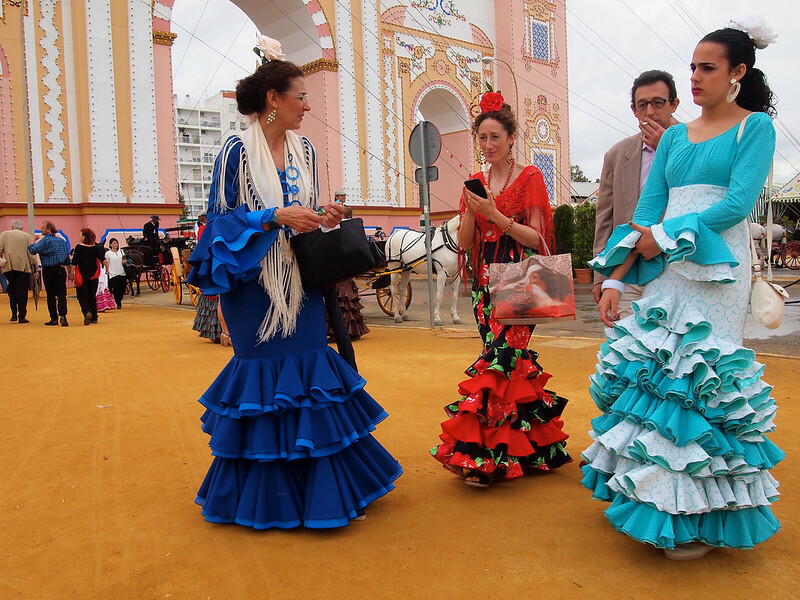 What to wear: You certainly don't have to spend money on a flamenco dress or suit, but people DO tend to dress up to go to the Feria. I wore a dress with leggings, and the most dressed-down local man I saw still had on a button-down shirt and dress pants. When to go: The festivities kick off after lunch time/early afternoon, and last well into the night – sometimes all night! I went in the late afternoon and stayed until about dinner time. Hotel Las Casas de El Arenal or Hotel Becquer – both beautiful boutique hotels that you can often find good deals on. 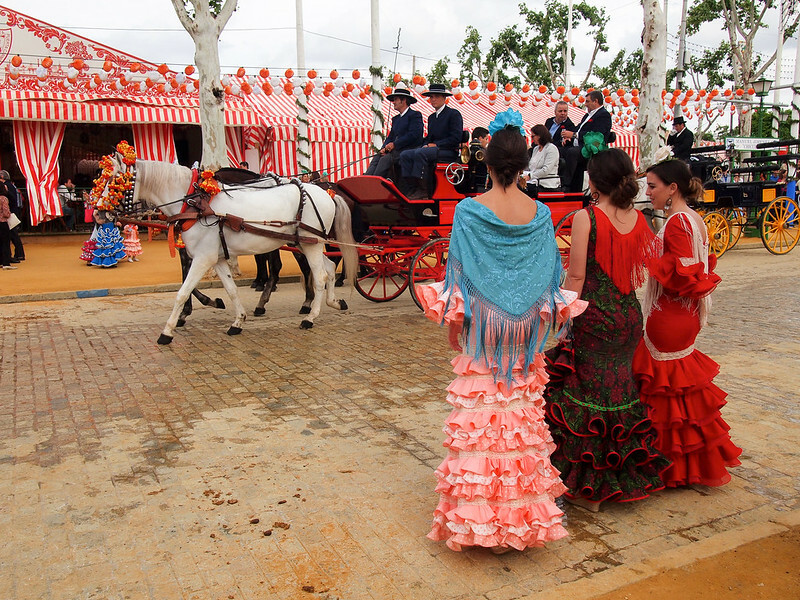 Have you ever been to the Seville Feria? If not, is it something you'd add to your to-do list in Spain? Terrific! Looks like fun. Wonderful colors. SO colorful! Even on an overcast day, everything looked so bright and vibrant! Oh my goodness, this just looks stunning! It was definitely really cool – especially since I had no clue it was happening/had never herd of it before I got there! That’s pretty cool that you just happened to stumble upon this. What luck! Definitely! It was a great way to spend an afternoon. Sounds like such a fun time to visit Seville! It was! 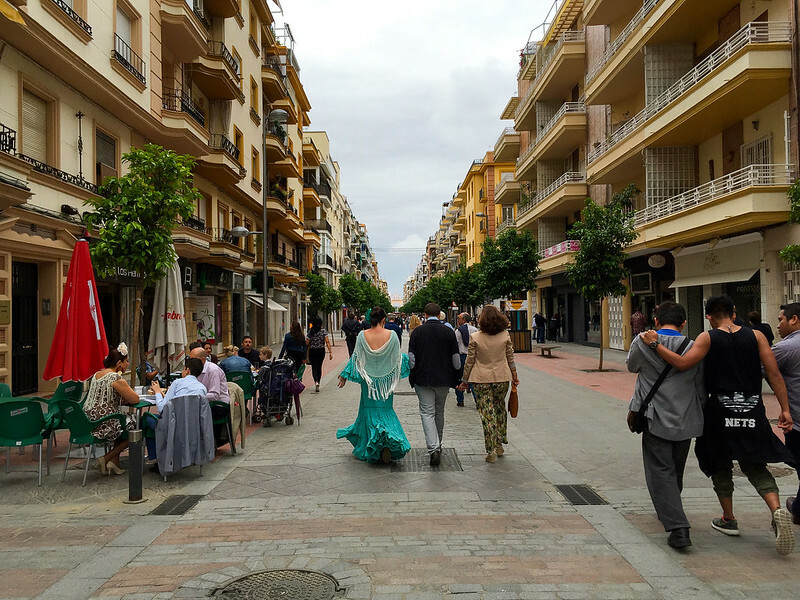 It was fun to spot all the colorful dresses, both at the Feria and just around the city. So much color! I just adore Sevilla. Great tips, thanks for sharing! I loved Seville, too, and this definitely was just icing on the cake! This looks like a movie set! 🙂 One I’d love to be a part of, just added Seville to my list of cities in Spain worth visiting, thanks! Seville is an awesome city – even without the Feria, it’s well worth putting on your list! I haven’t heard of these festivities before, but they look like so much fun! I like that everyone is wearing the traditional flamenco dresses and that even the men look so dolled up! I’ve been wanting to visit the south of Spain, if I would’ve know I would’ve planned the trip in this week! The traditional clothing was my favorite part, for sure. I loved watching people ride in on horses all dressed up like that! Aww thank you! I’m currently using an Olympus mirrorless camera – I have the OM-D E-M5 Mark II right now, though these photos were taken on an older model! And no, I haven’t done any photography courses, but I know there are a lot of great ones out there! Great information Amanda. 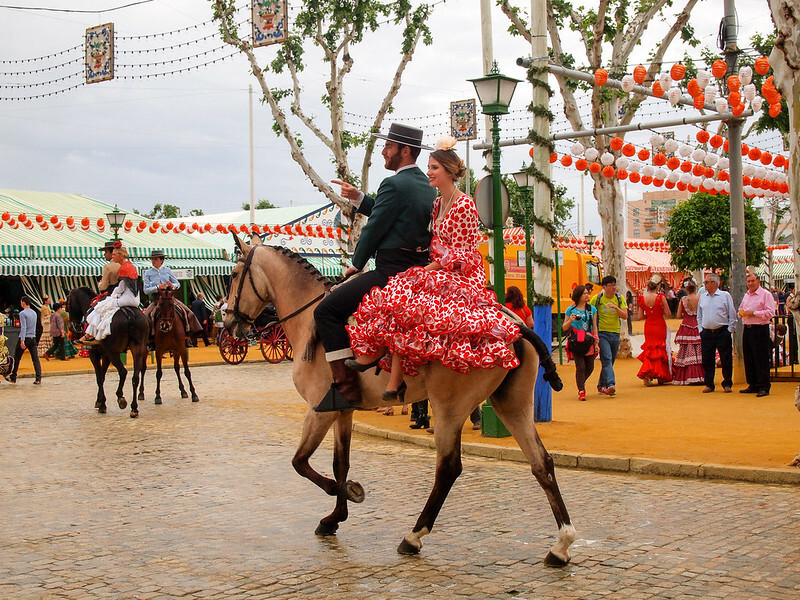 I just stumbled across your blog (because I was looking for info about the Feria, as I also did not know this would be on during my Seville trip and was thinking of changing travel plans because I thought it might be overwhelmingly busy). You have piqued my interest, it looks amazing, and as I love flamenco, this will be great to addition to my travels. Thank you. It’s not overwhelming at all, especially since mostly everything happens at the fairgrounds (so it’s not like all these people congregate in the city itself). But it’s VERY cool. I loved wandering around for a few hours! I studied in Seville in ’95 so I was there for Holy Week and Feria. You were lucky to find hotels. The government controls prices during the festivals but prices are at least double normal prices. So, by all means go. Both are wonderful but I preferred Holy Week. I’m curious, I repeatedly see it stated that this starts on Monday, but the dates from last year and for this year all start on a Tuesday. Which is it? The Feria always “opens” on a Monday night – but this is basically just a ceremony where they light up the fairgrounds and portada with thousands of lights. The first official day is a Tuesday every year. Thanks for your information! I don’t even know about the feria before planning my trip to Iberian and now I finally understand why the hotel price in Seville is so high compared to other cities in Andalucia during mid April. Yup, that would be the reason; it’s a huge event! I’ve lived here for quite a while, and two comments. 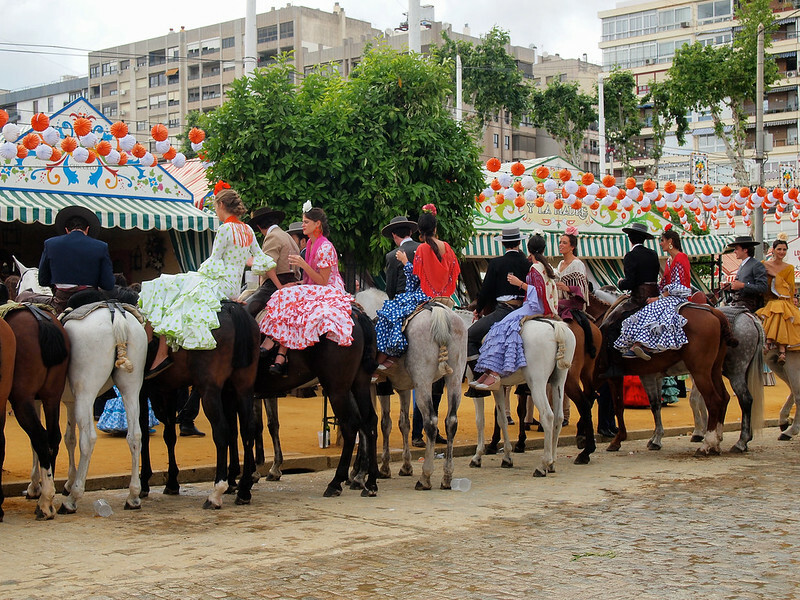 One, the Feria is one or two weeks after Semana Santa (the last Sunday of which is Easter Sunday). So, I’d be REALLY SURPRISED if they do it from May 6 next year (I have seen it published as from May 6 on one site, but it has been moved back before, it IS meant to be the April fair!). Secondly, pre-booking is a must! Hotels etc fill up & are at their maximum price. It was in May last year, too, from what I remember! The date of Easter (and Semana Santa) changes every year! We are going this year…so excited! I can’t seem to find anywhere if there is a cost to enter the Feria? If you can shed some light on this I would appreciate it. Thanks! Nope, there’s no entrance fee for the Feria grounds. And the public casetas are free, too, I believe – you just have to pay for food/drink.